Read Edge of Extinction: The Ark Plan first! 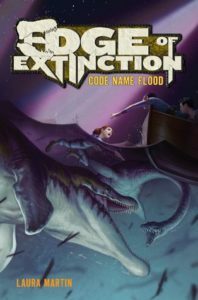 Fast-paced and fascinating, the Edge of Extinction series tells the story of a girl named Sky who lives in a world where dinosaurs have taken over and humans live in hiding. The author includes many interesting facts about dinosaurs and government in this book, along with clever plot twists, relatable characters, and lessons about life. With some similarities to Jurassic Park and Ender’s Game, this book is a dystopian tale with enough humor and hope to avoid overwhelming readers. Both children and adults can understand and enjoy this series.